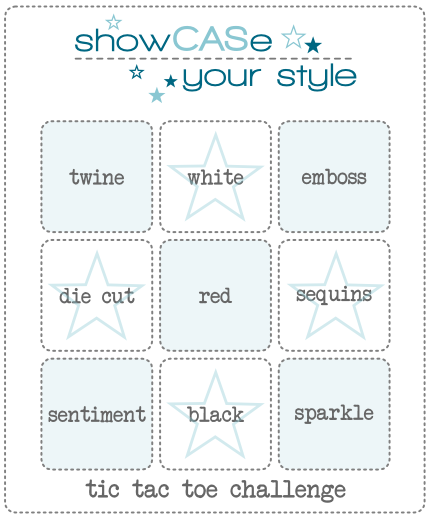 Whimsy Stamps has started a new challenge blog called ShowCASe Your Style - I have made that a link so you can go take a look! Challenge #1 is a Tic Tac Toe Challenge - I have included the tic tac toe "card" under my photo. I chose to go on the diagonal with twine, red and sparkle. I used a stamp from the Notables 9 - Holidays from the Whimsy Stamps October New Release and can be found here in the Whimsy Store. For this one, I fussy cut the sentiment but I really should invest in the dies that go with these stamps - my cuticle scissors will thank me! It is hard to see in the photo but the flourish sticker I used and the clear dots have a "rainbow" glitter to them - my sparkle part of this challenge. I'm definitely trying something new today - I put down the markers - GASP! I hope you have enjoyed my first ever CAS card! Comments and thoughts are always welcome! This is really pretty! Thanks for playing!